We have real diamond studded Jewellery with IDI certification. What could be a better gift than a precious studded gold watch to your loved ones, certainly bringing charm on their faces. Timeless treasure! 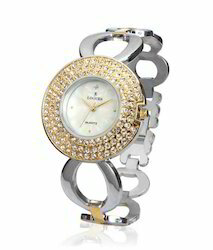 Women's diamond studded watches that are truly pieces of beautiful jewellery - uncompromising quality.